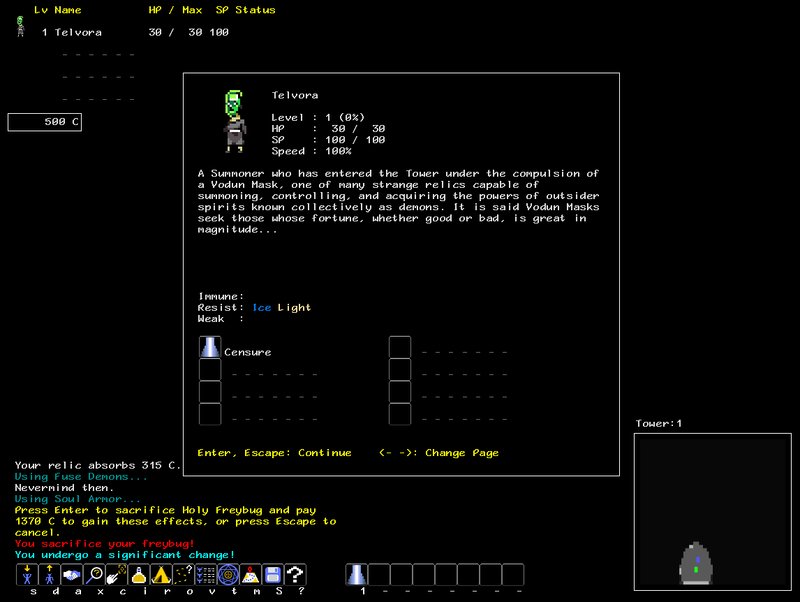 Another thing getting revamped in the next Demon build is character creation. First, the “bad” news: as I have long promised (threatened? ) 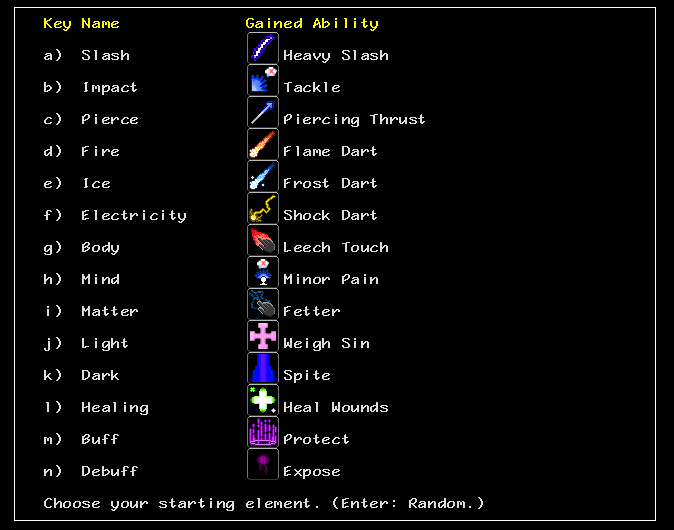 I am finally somewhat reducing the overall power level of starting abilities. 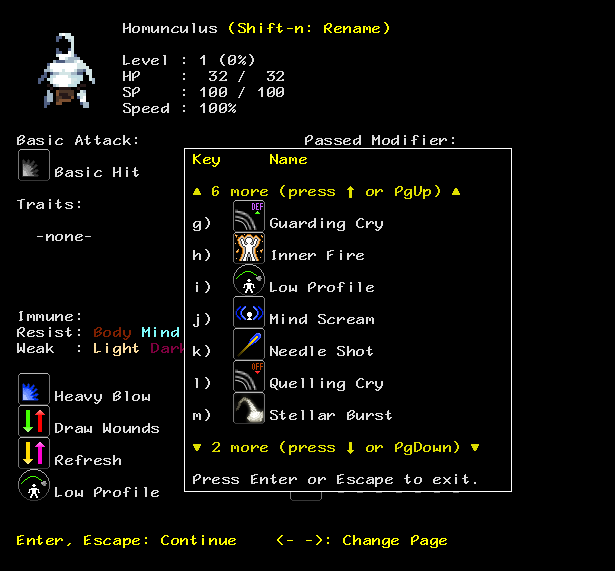 Too many starting abilities were of a caliber that you really didn’t need anything else for quite some time (hello, Frost Ring, among others), or often gave such early access to powerful mechanics that the Tower finally getting around to revealing them 10 floors in wasn’t all that impressive (hello, Alluring Gaze, among others.) These factors combined to make the early game relatively dull for experienced players. I’ve tried to choose each ability to be somewhat representative of its element and distinct in at least one way from the other options. Obviously with only one element trying to stand in for elements that have dozens of abilities, the representation part won’t be perfect. 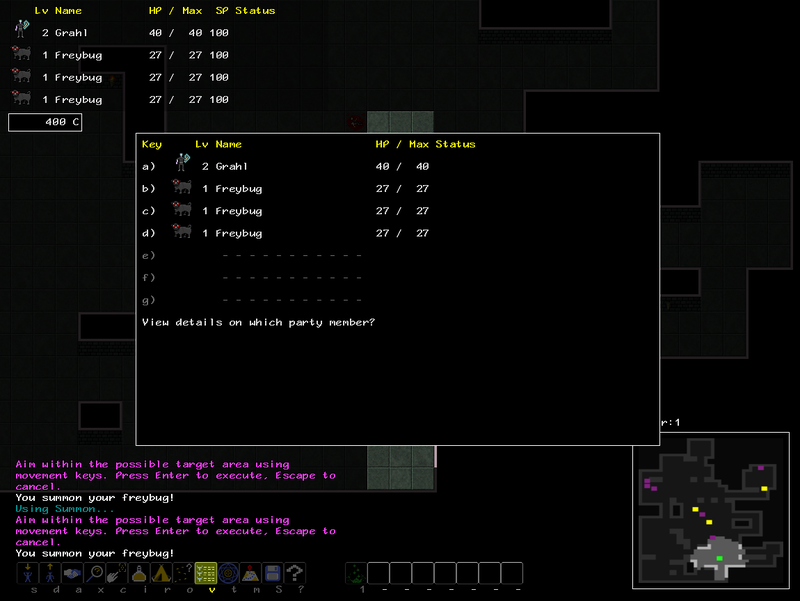 I also tried to make sure none of them are “traps”: combined with your new starting ally (more on that in just a moment), all of these should be capable of helping you recruit a minimal party on the first two floors and get you rolling properly. 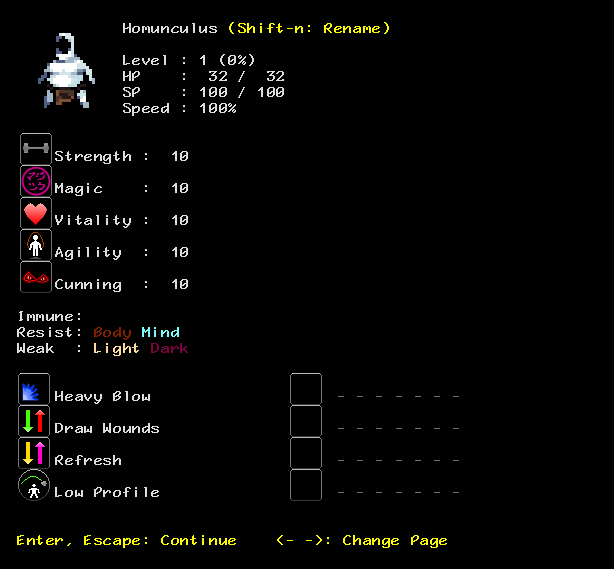 Meet the Homunculus. You only get one, so treat him well! You always get him though: you can no longer choose a starting ally, this is the one everyone gets. However, he has been designed to be of use to pretty much any build: Heavy Blow gives him a decent combat ability that is effective against the vast majority of early enemies. Draw Wounds lets him support melees, or anyone else who needs healing, without distracting him from attacking. Refresh lets him support heavy SP users, aided by the fact neither Heavy Blow or Draw Wounds uses up his SP. Finally, Low Profile lets him helpfully tank for anyone using projectiles without interfering with their attacks. His completely neutral stats make it possible to grow him anyway you want and get at least decent results. 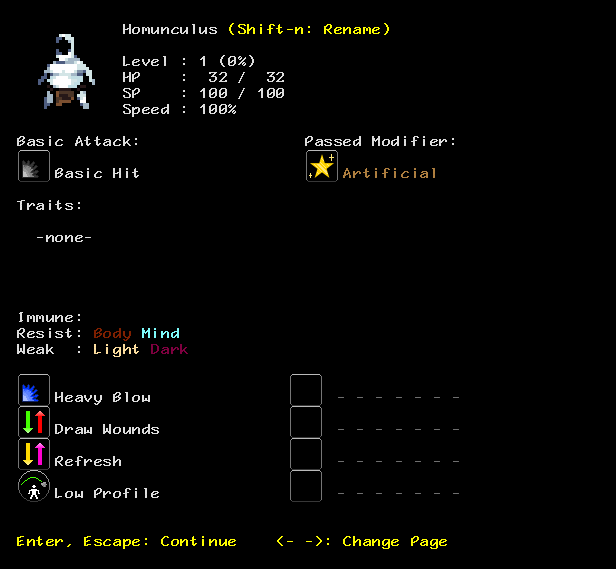 Homunculus has other odd properties: He’s a bit of a semi-Unique. 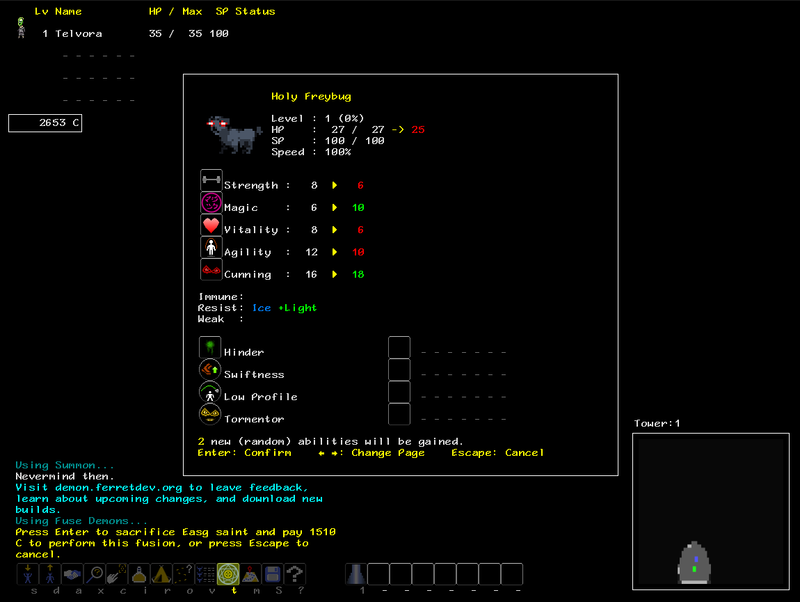 He is not technically Unique, but he has two of the strongest benefits of Uniques: the extra MaxHP and… a unique modifier. 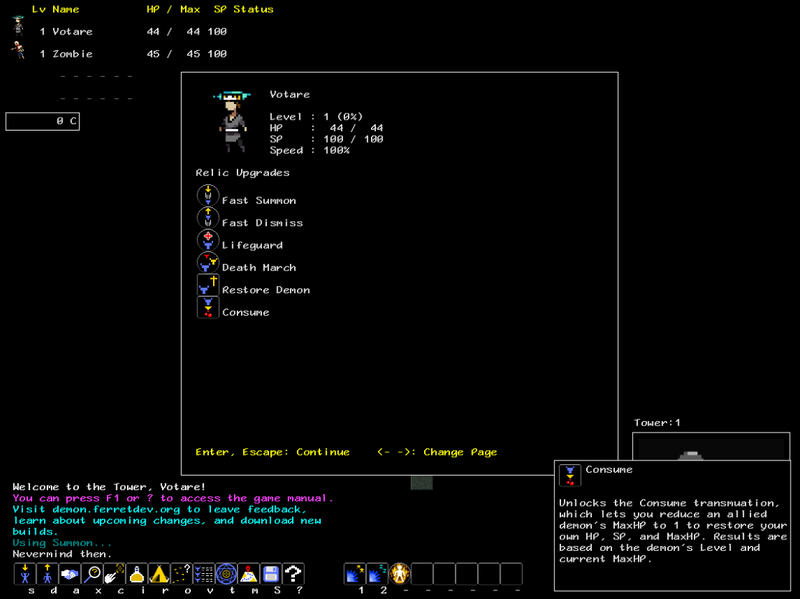 The unique modifier in question, Artificial, adds Body and Mind resistance, “evens out” stats, and offers one ability of each element for its ability pool. The abilities offered tend to be generally useful things. Even if they end up not being appropriate for the demon you give the modifier to, it is almost certain someone in your group will appreciate learning them via Copy Ability. So.. yeah. I won’t deny it: this is a pretty big change to character creation and the early game. It’s definitely less power. Could also say less choices, but I’d argue that one: There’s less up front choices, but I think the high powered starts were removing the need to make many real choices in the early game, so it may be a wash on that front. Another way of putting it: “character creation” now occurs more in what you decide to recruit/learn in the first few floors, rather than before you start playing. My hope is that this is more interesting and fun, both for new players and experienced ones. That said, I don’t expect this to be universally popular. The only other thing I’ll add is a reminder that if this proves to not work out like I’m hoping, I *have* been convinced to undo unpopular things before. Granted, it’s been awhile since the last one (does anyone remember when incompatible demons couldn’t be in the same party? ), but I do pay attention and respond if something just plain doesn’t work out. Hopefully it won’t be too much longer before you can try all of this stuff out yourselves. Cheers, and thank you! As you can tell from the screenshots showing the removal of restrictions on duplicate demons and having no weaknesses, there’s a lot going on in this next build change wise, to say nothing of the already previously discussed Demon Preservation mechanic and new/changed Relic Upgrades… or for that matter, the barely discussed revamp of character creation. To that end, I’m putting on hold any major adjustments to healing/damage in this build; I want to see what the results of the rest of the changes are first. PS: There will definitely be a new scoring version with the next build, given how much is changing. Though this next build isn’t *the* Upgrades build, it will have a small number of new and changed upgrades. Fast Summon: Converts Summon to a fast action (takes 1/2 a turn instead of a full turn.) Unlike Quick Summon, this has no cooldown. Fast Summon is now a pre-req for Quick Summon, and replaces Quick Summon has a starting upgrade for Crown of Glory. Fast Dismiss: Converts Dismiss to a fast action (takes 1/2 a turn instead of a full turn.) Unlike Quick Dismiss, this has no cooldown. Fast Dismiss is now a pre-req for Quick Dismiss, and replaces Quick Dismiss has a starting upgrade for Crown of Glory. 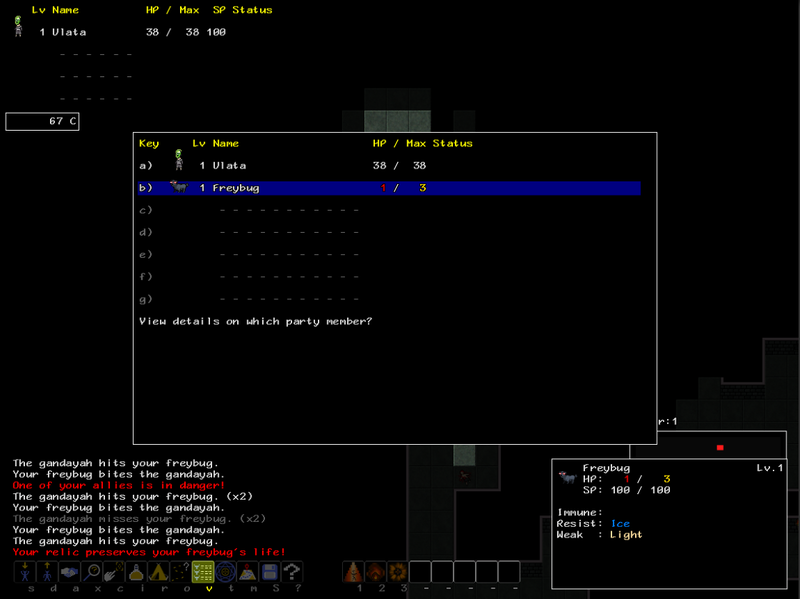 Lifeguard: Significantly reduces the MaxHP lost when Demon Preservation is triggered. Death March: Requires Lifeguard. 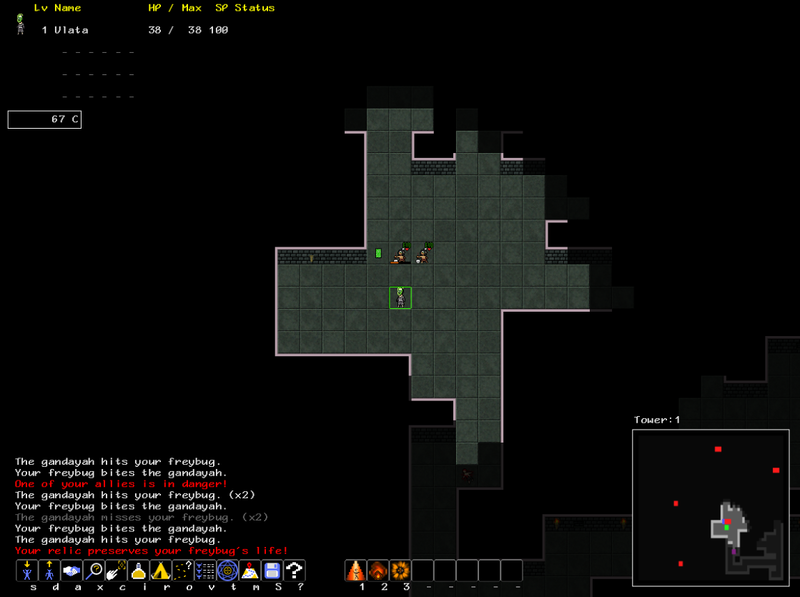 Restores a demon’s HP and removes negative status effects when Demon Preservation is triggered. Restore Demon: Unlocks Restore Demon, which allows you to revive dead non-unique demon allies. No longer costs credits, but will have a cooldown similar in nature to Enemy Lure. Consume (changed): No longer an upgrade to Delete Demon, it is now unlocks its own Consume transmutation, which you can use to heal yourself by draining your allies’ MaxHP. First up in the parade: Demon Preservation! * Restore Demon will no longer cost credits, but has a non-standard (to be designed/decided) cooldown mechanic. Additionally, it will no longer be usable on uniques. * Consume will no longer require Deleting a demon, instead it will be its own action, with the results based on both the level and MaxHP of the target. The target’s MaxHP will be reduced to almost nothing, rather than dying. Note: Consume will give practically no benefits on demons with any significant damage to their MaxHP… though the results of using it on demons with artificially boosted MaxHP might be surprising. * Damage and healing will be increased across the board again. One of the major reasons for making this change is so that I no longer have to balance damage and healing against very very unlikely, but still vaguely possible, “effectively one shot” scenarios. Now that both summoners and demons have some cushion against such “bad luck”, I will be able to take off the leash a bit and speed up combat overall. * …and other changes as well, to be decided. I’ll continue to post updates and information as they become available (but still in busy times at work, so the pace will remain slow for a little bit longer.) Cheers!